cards combining the Classique: Elegant and Anchored Collections! across the paper with a black Staz On ink. Next, I stamped the image onto several designs found in the Anchored 6X6 Paper Bundle. I hand-cut the small squares and then adhered them over the matching stamped images on the paper. For extra dimension, I hand stitched a few X's over the largest squares with a stormy blue thread. I used the Waterlily stamp and sentiment and then the leaves found in the "What's For Dinner" Set. I used the neutral side of the Elegant Foundations 2 paper and stamped the lily image in both VersaMagic Midnight Black and Sea Breeze. I hand-cut the images out and then arranged them over the Elegant Journal Card. The leaves were stamped with a VersaMagic Bamboo ink and then adhered. I also used the Midnight Black ink to add color to the wooden butterfly. Sweet Stamp Shop stamps give you a nice, clean image with a variety of ink types. WOW...shellye, I love your cards! Awesome how you combined Authentique with Sweet Stamp Shop! Love the red/white/blue card. It is so pretty - but in a masculine way. Thanks for sharing the projects. Showing once again why I am in love with the Anchored paper kit! Love these...and loving all the stamps as well! Gorgeous projects. popping in from the sweet stamp shop design team to say hi!!! these cards are so adorable. :) i am loving all of your new lines and designs! These cards are great! The teal, white & black just work together so well, they make the card look so delicate. Thanks for sharing it with us. Just saw Sweet's post, so I will check back in on Weds. with you both. Wow, both cards are absolutely stunning! just beautiful! 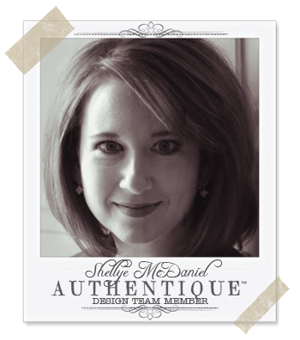 Authentique and Sweet Stamp Shop work perfectly together! I love anything red white and blue! Fantastic cards! Love the stitching detail in the first and the wooden butterfly with the pearl body! These cards are just wonderful! LOVE the first one with the rounded squares over the stamped shapes. WOW! Your cards are gorgeous! Your masculine card is wonderful to see since they can be a challenge!! Both of your cards are wonderful, but I really like what you did with the squares on the 1st one! I love the use of string and stitches on each of the cards - so unique and interesting! Both of these cards are fabulous. I especially love that sentiment with the anchored card & the twine tied at the top really sets if off. on some of the squares. I really love the design of the "sea" card--that is a lot of love!!! the other card is so pretty-love the colors! Beautiful cards! I really love the colors and butterfly on the second one. Thanks for sharing. I love all of the layering and the color combo of the "Thank You" card. Awesome projects. Really love that first one with the nautical feel. The stitching on the squares really adds. I am thinking this would be such a great card for OWH for someone on sea duty! Very pretty! Fun dimension and love the stitching on both cards. Love that unique design on the first one!! LOVE these cards! I am looking forward to our Authentique and Top Dog Dies Hop! I like the nautical look of the first one and the elegance of the second. Very pretty thank you card. Gorgeous cards!! Especially love the lilies with the Elegant Six papers! Gorgeous masculine design, love the layers and the second card is so beautiful with the color palette, love all the texture and dimension with the layered flowers!! !